ShowDown for WooCommerce allows you to hold popularity “Battles” and Yay/Nay (also known as Hot or Not) contests with your Products library. That’s it! Now, create a new Page and embed the ShowDown shortcode, using the handy generator, and your Products are now battling against each other. Drive up your customer engagement and sales with ShowDown for WooCommerce! Once you download the plugin, simply upload it via your Plugins upload panel and activate. You will now see a dedicated menu item for the plugin custom post type called ‘Competitors’ and a dedicated admin panel called ‘ShowDown’. Visit the ShowDown > Settings page to check out the options and also take some time to go over the quick help provided in the same section. Upload as many “Competitors” as you like using the dedicated Custom Post Type created by the plugin, once your image has been uploaded simply set it to be the “Use as featured image”. 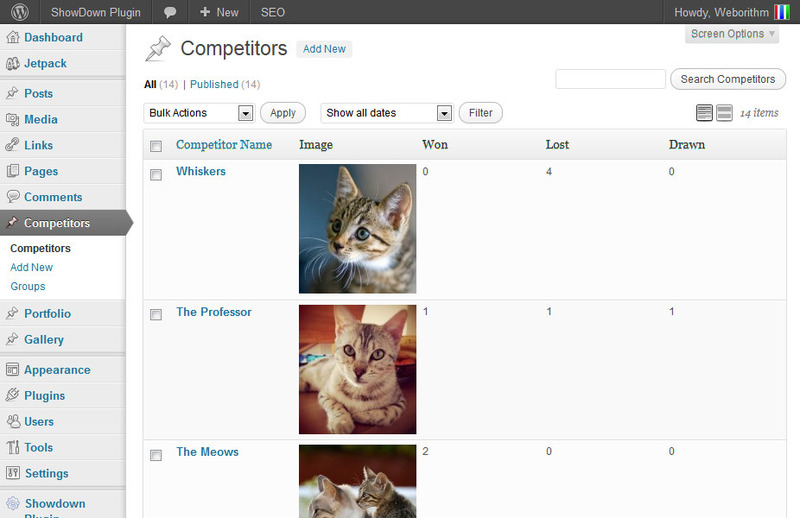 The plugin will automatically pick the image and use it in the Yay/Nay (Hot or Not) and Battle contests. 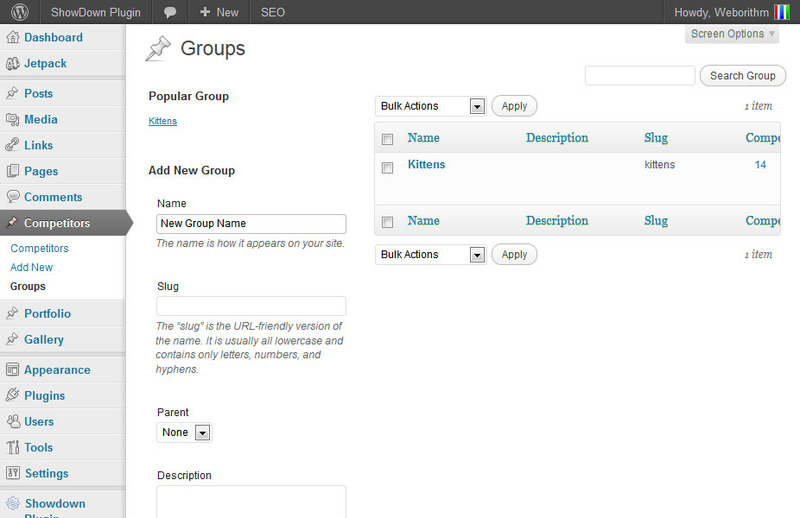 You can even set up “Groups”, they work exactly the same as regular WordPress categories. 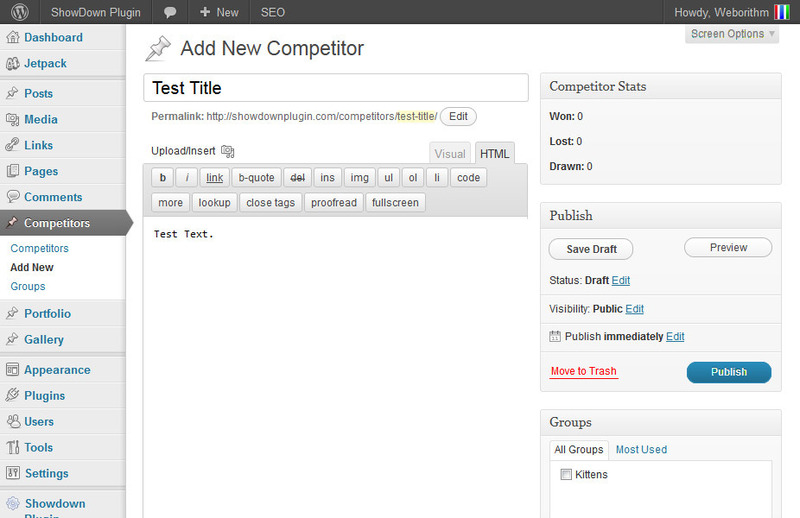 Or, you can set your Competitors to battle it out in the Battle mode. 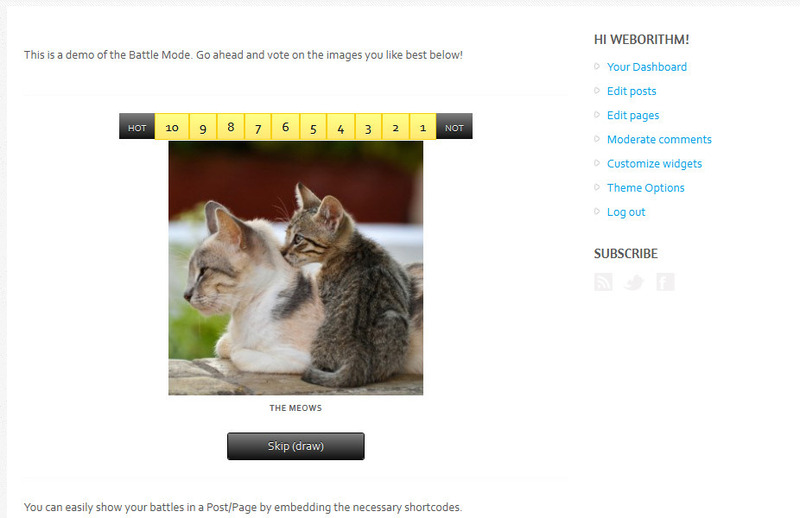 Simply use the shortcode generator when you create a regular Post/Page and drop your Battles in. Don’t want to use it with images? Not a problem, you can feature text or embed videos as well! Check out our demo site for a live preview. All the text in the plugin is fully customizable, so you can use any terminology you like. Plus it’s 100% translation ready! Use the handy shortcode generator to enter your shortcode to show your contests in your Posts or Pages. Want to embed contests related only to a specific Group? Not a problem, the plugin can segment via Groups as well. The plugin also allows you to customize the links on your images, so you can link them with your affiliate link to products and create a potential affiliate revenue stream. Plus now with WooCommerce support, your Products get more visibility and an element of fun around them. WooCommerce: Set the plugin to use your WooCommerce Product library for Battles and/or Yay/Nay contests. - Fixed bug for sidebar widget which was showing results from all categories. - Added "About this image" section in the Add New Competitor screen for Yay/Nay contests. - Set up "Battles" and "Hot or Not/Popularity" contests simultaneously. - Restrict repeat voting on Hot or Not/Popularity contests. - Ability to reset stats for Competitors. - Display Group name on Battles and Hot or Not/Popularity contests. - Top 10 for Hot or Not/Popularity contests, previously only available for Battles. - User initiated results sharing on Twitter and Facebook. - Custom widget available under Appearance > Widgets area. - Change color of Hot or Not/Popularity contest voting buttons. - Fixed image filtering option in shortcode. - Fixed "Groups" filtering in shortcode. - Hot or Not/Popularity Mode. - Affiliate Link Custom Field.